Jagadguru Kripalu’s Kirti Mandir opened to the public today after a grand and historical celebration spanning three days. Thousands of people from all over India and the world attended the event, which included elaborate ‘puja’ ceremonies, daily prayers and meditation (sadhana). The Presidents of Jagadguru Kripalu Parishat, Sushri Dr. Vishaka Tripathi Ji, Sushri Dr. Shyama Tripathi Ji and Sushri Dr. Krishna Tripathi Ji officiated at the event, leading thousands to the entrance and cutting the ribbon as Vedic chanting took place. The doors were then opened as they walked in to see a unique sculpture that has never been seen in any temple before. 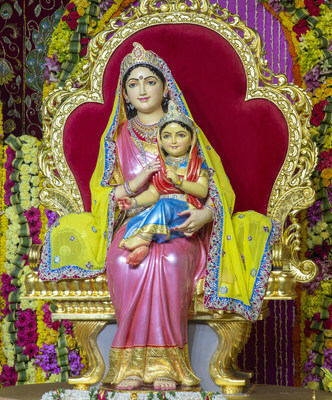 The temple is dedicated to Shri Radha and her childlike form is the main focus of this unique temple. Within the temple, unique paintings that do not exist anywhere else have been placed and Vedic teachings can be found on the walls. It is interesting to note that no cement or steel has been used to build the temple. Instead, it is built using the traditional Dravidian and Nagara style of construction. Performers representing different parts of India played unique musical instruments, as everyone danced during the celebrations. Balloons were released in the air to mark the opening of the temple and a grand Aarti also took place this morning to mark the public opening. 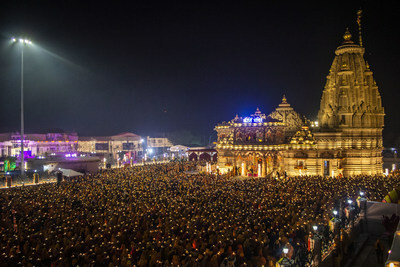 A sea of flickering lights were seen all over the temple as thousands took part in the Aarti. The founder of this unique temple is Jagadguru Shri Kripalu Ji Maharaj, who has founded a large organisation that offers spiritual and charitable services to the public. Every year, hundreds of thousands of disadvantaged people benefit from the work of Jagadguru Kripalu Parishat, the Trust he had setup. The Jagadguru Kripalu Chikitsalaya hospitals serve over 5000 individuals daily and the school for disadvantaged girls, Jagadguru Kripalu Parishat Education, educates over 4000 girls annually. As part of honouring the opening of Kirti Mandir, 60,000 impoverished individuals were given important necessities. Today, 15,000 of them were in Kirti Mandir to receive them. Jagadguru Kripalu Parishat is a non-profit, charitable, educational and spiritual organisation, dedicated to increasing spiritual awareness and helping those in need in society as a whole. Jagadguru Shri Kripalu Ji Maharaj, who was with us from 1922 to 2013, received his title from the Kashi Vidvat Parishad in January 1957 at the young age of 34 years old. Since then he spent his whole life working for the benefit of society through his organisation. Jagadguru Kripalu Parishat is now managed by Sushri Dr. Vishaka Tripathi Ji, Sushri Dr. Shyama Tripathi Ji and Sushri Dr. Krishna Tripathi Ji. Information on Kirti Mandir and Jagadguru Kripalu Parishat can be found at www.jkp.org.in and all updates on the organisation can be found via www.facebook.com/jkpindia.